Marissa Mayer has always been in news since last year. Yahoo’s CEO has just acquired another start-up and reveals her plan to boost Yahoo’s mobile and social offerings. Distill staff members will be joining Yahoo and will work on the on going projects as planned. Distill is a San Francisco-based technical recruiting software firm and is best known for its mobile advertising platform Tapjoy. 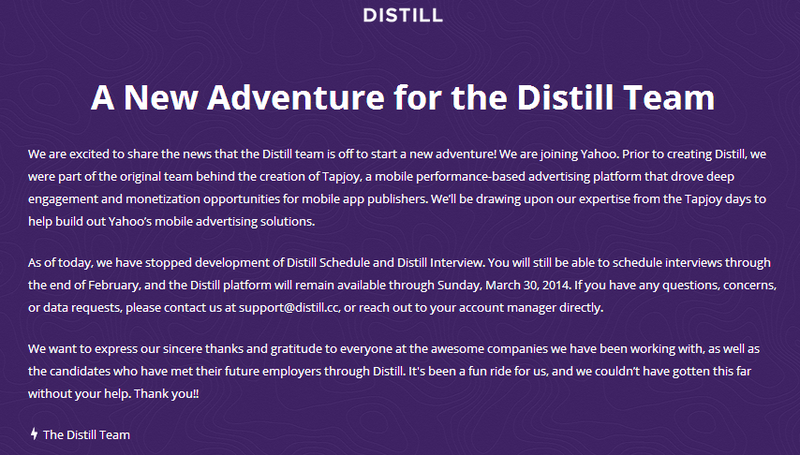 Distill's blog post stated its team “is off to start a new adventure” at Yahoo. They had raised $1.3 million in funding from investors including Felicis Ventures, China’s Innovation Works and DN Capital. Distill team in its website, shows a message for its users regarding the acquisition. “Prior to creating Distill, we were part of the original team behind the creation of Tapjoy, a mobile performance-based advertising platform that drove deep engagement and monetization opportunities for mobile app publishers. We’ll be drawing upon our expertise from the Tapjoy days to help build out Yahoo’s mobile advertising solutions.” stated in the blog post. The Distill platform will remain available through March 30. Mayer has been busy in acquiring more than 20 small businesses last year as well as three last month including smartphone-homescreen launcher Aviate to organize apps on users’ Smartphone home screens, enterprise app maker Tomfoolery and virtual gaming company Cloud Party and maker of the Days diary iPhone app Wander just a day ago. Among big acquisitions last year, there were Tumblr for $1.1 billion, e-mail management startup Xobni for $70 million and popular news-reading app Summly for nearly $30 million. It seems that Yahoo has taken the pace to boost up its production, service and will go with its offerings in all web technology aspects.